Amateur radio is an all volunteer service made up of people from all walks of life. From the most famous people you know, to the average “Joe”. They are typically folks that are public service minded and are interested in the way things work. 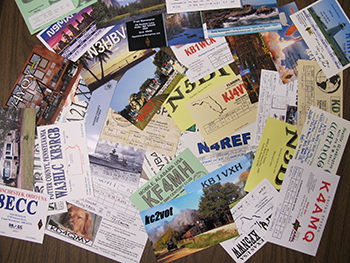 Every amateur radio operator has his or her own reasons for being in the hobby. Ham radio has so many different aspects that you can spend your whole life exploring them all. From morse code and voice communications, to digital and video modes. From public safety communications to looking for people in rare countries to make contact with, to talking to astronauts on the International Space Station! These are just a few of the many aspects of amateur radio. The FCC is the governing body that makes the rules and gives us use of the radio frequencies that we hold. Amateur radio operators have a long and impressive history of public service and helping out in times of emergency. Did you know about 150 amateur radio operators participate in the Pittsburgh Marathon? We provide communications for all aspects of the race. Not just the marathon either. You will find us at The Race For The Cure and other major events. There are contests and special event stations such as stations set up at various lighthouses around the world and many other special locations. These are just a few areas that amateur radio can be found. There are many, many more! What does it take to become an amateur radio operator?You need an FCC granted license to use amateur radio frequencies. To get a license you need to know some things about amateur radio operating procedures, electronic theory, and FCC rules, also morse code for higher license classes. There are three classes of amateur radio licenses. the first being Technician class, then General class, and finally the Extra class license. Each license comes with increased operating privileges, and a more involved test. Learning morse code is required for the General and Extra class licenses. Once you get your license, it is up to you as to what you do with it and how far you want to go.What equipment do I need? Is it expensive? That is up to you and what you expect to do with it. There are small “hand held” radios that you can use in a number of different ways, usually to talk to people within, say, a 100 mile radius with voice or digital modes. You can even use these little radios to get into the internet and talk with people in other countries! The other type or radio is the one you can talk to people around the world without the use of anything but your antenna. Known as an HF radio, HF being “high frequency”. These can range in price from under $100.00 to over $4000.00! All of them do about the same thing depending on the bells and whittles you want. As for antenna? It can be as simple as a length of wire strung between two trees or as fancy as a rotatable “beam” antenna. Either one will allow you to talk to far off countries! So you see, it really is up to you and what it is that you like about the hobby!How hard are these tests?As for the math, can you add, subtract, multiply, and divide with a calculator? That is all you need. You will also need to remember some rules and regulations as well as operating procedures. Morse code is likely the hardest part of the job, but you don’t need to learn morse to get your technician class license. And once you learn the code you may find out it can be a great way to communicate! Many people use it every day just for the fun of it. The best way to learn morse code is through persistence, a little at a time. Yes, you can do it.Who puts on the classes and who gives the tests?Both classes and test are usually done by amateur radio clubs. The tests are given by volunteer examiners or VEs.VEs are certified by the FCC and the ARRL to administer amateur radio tests. Who is this ARRL? They are the Amateur Radio Relay League. These folks are similar to the NRA and gun owners. The ARRL represents amateur radio in governing matters and do a great job of keeping this hobby from being torn apart by commercial interests. Our frequencies are worth billions of dollars and allot of commercial interests would love to get them. You can check them out at www.arrl.org . They are the premier source for amateur radio information. Getting back to who gives the tests, VEs are just amateur radio operators that are certified to give tests. The tests are normally given at a club meeting place, library, or other public location. You need to have two forms of ID and the fee for the test, normally around $10.00 . The tests are multiple choice type. There is no age limit. Skyview Radio Society has been around since 1960. We are one of only three clubs in western PA that has our own clubhouse! We will have our class and testing at our clubhouse. You can use the map on the home page of this web site for directions. You can come and visit us at our business meetings, social meetings, or other events that we have at the clubhouse. Business meetings are the first Tuesday of each month, and social meetings are the third Tuesday of each month. Both are at 7:30pm. Feel free to stop by at these times. We have a meeting room and a radio room with a nice array of antennas. In amateur radio, everyone goes by their callsign. The club callsign is K3MJW. For more information, please e-mail k3mjw@arrl.net . We sincerely hope to here from anyone interested in joining this honorable hobby. Best wishes from the Skyview Radio Society.